During my search for a really fun and fast paced zombie game, I stumbled upon Red Ops 5, which promises to be just that. 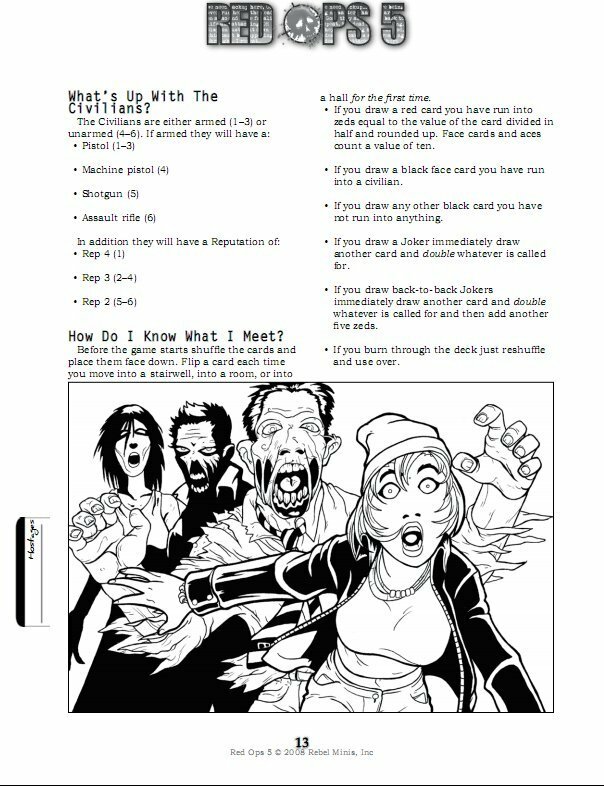 Utilizing a small military force, players act as first-responders to the zombie plague outbreak. 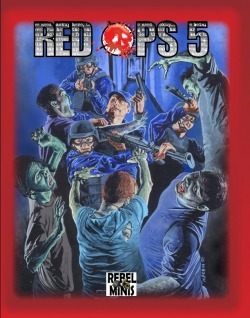 Red Ops 5 borrows many of the game mechanics of the award winning All Things Zombie rule system from Two Hour Wargames. I know what you're thinking... I wasn't a big fan of ATZ, so how could I possibly like this? Read on. 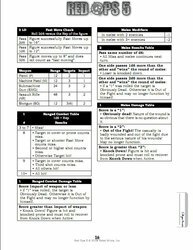 As hard to believe as this may be, the Red Ops 5 rulebook is truly different, actually I'd have to say it's a huge improvement over ATZ's. First up lets talk about the rulebook. The cover depicts what appears to be SWAT types going toe-2-toe with some Zeds, giving you an idea of what this game is all about from the start. At the core, it's also clear that this game was totally inspired by the opening scene of the original Romero masterpiece Dawn of the Dead, in which a SWAT team converges on an apartment building filled with Zeds. Right off the bat, as soon as I flipped through the next few pages, I was impressed. 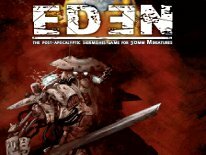 Granted Red Ops 5 is black and white manual just like ATZ, and it's not as fancy as say the softcover full color offerings from Privateer Press, but most importantly, it details everything you need to know how to play Red Ops 5 clearly. Best of all, it just flows well, and there's no lack of diagrams and illustrations to show you what to do. It's just altogether a solid rulebook product. It's as if Rebel Minis aimed make a true zombie skirmish game from the core ATZ combat rule system, cutting out most of the distracting RPG stuff and complexity, and the end product is Red Ops 5. Red Ops 5 is only 24 pages from start to finish, in comparison ATZ is about 82 pages. That's a big difference, and honestly, the Red Ops 5 rulebook looks light years better. 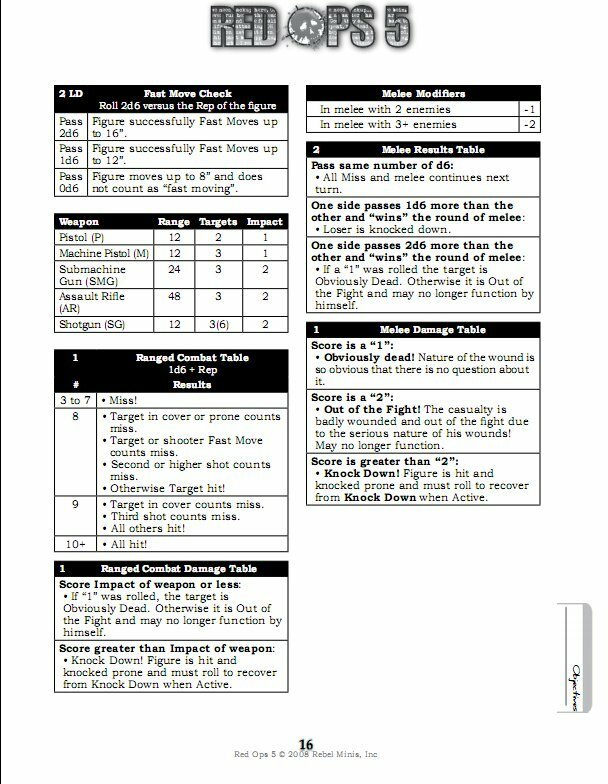 There's only 2 quick reference charts found in the back of the book, so Red Ops 5 isn't as chart heavy either. In all fairness I have to say, there is a lot more to ATZ via the RPG elements it offers, which does allow you to create more dynamic environments to play within. So don't think for a minute that ATZ is a bad game in any way, I just prefer Red Ops 5 more for its' simplicity. Gameplay is very straight forward. You control a 4 man team of first-responders. The rules say that group can be American SWAT, British SAS, Russian Spetnaz or German KSK. I can also see the group being US National Guard, Army, Marines, Navy SEALs, and/or most any other military force of 4 characters just the same. Like ATZ, Red Ops 5 also isn't scale specific, but they do say it's designed for 15mm and 28mm scale figures. Therefore what ever 15mm-28mm figures that you have that can depict zombies, and 4 military troops will do the trick. I think some 40k Chaos Plague Marines for zombies versus some Space Marines would be an interesting sci-fi twist on Red Ops 5 too, nothing says you can't use them. So all you need to play Red Ops 5 are some figures for first-responders, about 10 zombies per responder, a handful of D6 dice, a ruler, a 3X3 playing surface, some terrain, and a deck of playing cards with jokers. This is where Red Ops differs from ATZ, as the card deck is an added element over ATZ, and the playing area is about 1 foot less than ATZ. The very same movement, shooting and melee rules are in place from ATZ, only they've trimmed the fat to keep it faster paced, and flowing more smoothly (less weapons overall and a lot less sub-rules). Movement for humans is 8-inches, zombies move only 6-inches, and only humans can Fast Move (16/ or 12 inches depending on the roll result). All of the dice rolls are handled via D6 dice. 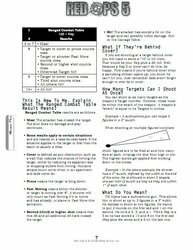 To hit for ranged is one D6+Rep then check the chart for the result, 10 is always a hit, results of 9 & 8 have some criteria to meet to be a hit or not, and 3-7 is automatic miss. Melee is two D6 vs Rep (and any modifiers), and zombies only get to roll one D6 in melee. They also make it clear that there's really only three things a player needs to remember about their characters, what Reputation Value they are, what weapon they're using, and if they're wearing armor or not. Reputation value 1 and 6 has been eliminated for Red Ops 5, so the highest Rep is 5, and lowest is 2. Although the three rules for Stars characters from ATZ are almost the same in Red Ops, but differ slightly. For instance, when you are to “Cheat Death” in Red Ops 5, you can roll to come back at the same Rep if successful, or end up coming back minus one, or end up Infected if you were Out of the Fight, or you'll never be seen from again if you were forced to Runaway. Here's where the cards come into play. To figure out what pops up, every time you enter a stairwell, hallway or room for the first time, you flip a card. If a red card is revealed, a number of Zeds equal to the card show up. If it's a black card you run into a civilian. It's that simple. Drawing a joker means you draw again, and double the value of that next card is what you spawn. Although you do have some more rolling to do to determine if the Civilian is armed or not, and what their Rep is if that's what spawns. At the end of a turn depending how many shots fired, you'll need to roll for more zombies spawning too. Therefore zombies do keep coming from rolls, in addition to the card spawns. 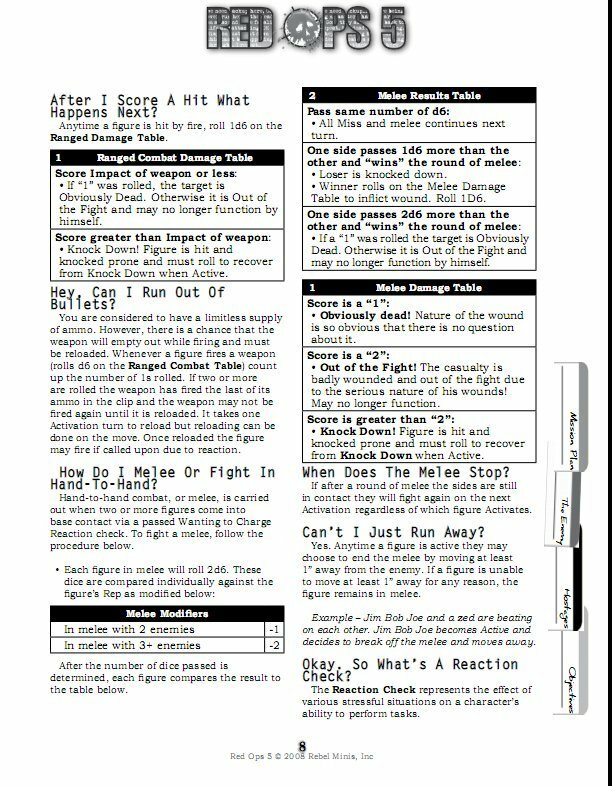 I love that at this point the rule book says at the top of the next page “Is that it?, and then next it says ”That's it. Now here's the scenario”. Technically all of the rules take up only 12 of the 24 pages (from pages 5-17). This I like. 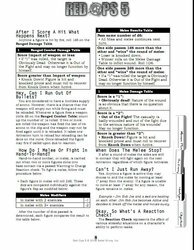 It also goes to show how much extra stuff ATZ has with 23 pages of basic rules. Red Ops 5 is so much easier to jump in and start playing. The last few pages detail an apartment building scenario complete with maps, some advertisements for other Rebel Minis and Two Hour Wargames products, with links to the Two Hour Wargames forums and website, and lastly the two pages of quick reference sheets with all you need to refer to too play the game. The scenario provided takes place in a 3-story apartment building, and saving Civilians is the objective. Simply make it out alive with all six civilians and you win. Victory points are scored at 1 victory point for each civilian you rescue, and 1 point for every team member to make it out alive with them. So there's a total of 10 points to be had overall. The rulebook itself is a huge improvement over ATZ's, but again, ATZ can be this simple too, if you know what things that you can omit, but the rulebook for ATZ never tells you this. I'd go as far as saying that Red Ops 5 is probably a good game to start with to learn the basic combat system of ATZ, and if you enjoy Red Ops 5, and are looking to expand upon it... then ATZ would then be the next logical step. I think if I learned Red Ops 5 first, that the ATZ rulebook may have been easier to decipher too. However, you shouldn't need to read one rulebook to learn the other either. I really thought that the card mechanic was brilliant, It just feels less RPG-ish to me. Granted I'm still not a big fan of having to play out what the zombies do, and what my characters do both tho. I think this game, and ATZ both could benefit from making the zombies meaner so that they'd be more fun for a 2nd player to play them. Nothing says that a 2nd player couldn't run the zombies now either, but it's definitely more fun to be the human player by design at present. By looking at it, this seams more like a close quarters combat style skirmish game, with the apartment building scenario provided. I tried applying Red Ops 5 to an outdoors setting, and in doing so I found that you'll need to add a few house rules for when to turn some cards, since there are no stairwells, hallways and rooms to enter into when outdoors. With only one scenario provided, it's definitely a little light on content too. Although they use no squares on their maps provided, I can see old HeroClix maps being a really good play aid for this game to give players more to do in Red Ops 5. There are many great indoor HeroClix maps out there to choose from for cheap. The author mentions that he presented the game very much in the same way you'd encounter a game like this in a gaming convention demo situation, and overall, I'd have to say that would best describe this game overall. It won't replace other more commonly known and popular gaming systems for wargaming anytime soon, but it's definitely a really nice beer and pretzels game, which doesn't take a huge time investment to get the hang of. 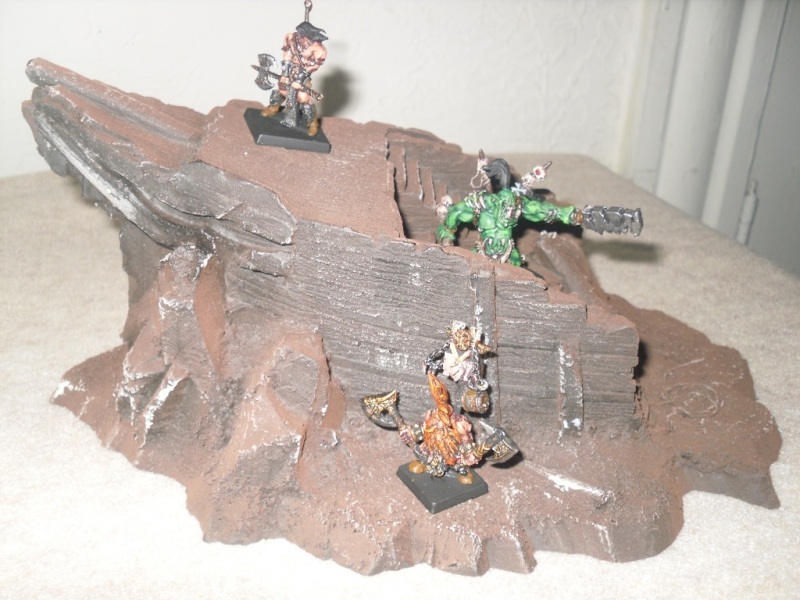 Here's where Rebel Minis really knocks it out of the park...Red Ops 5 is JUST $6.95 via a downloadable .pdf file. Granted I really prefer a hard-copy more than .pdf rulebooks, but for that much it's hard to knock it. That's less than 1/3rd the cost of All Things Zombie: Better Dead Than Zed hardcopy, and it's light years easier to play and comprehend.